It is a good habit to change your SBI ATM Debit card periodically to avoid any security risk, State Bank of India (SBI) now allows you to change your SBI ATM Debit card PIN online through net banking. What is ATM card PIN? It is 4-digit pin to make transactions at ATM machine. You need to enter this PIN while doing any transactions through ATM machine. Many ATM card now also support 6-digit pin. If you want to change your SBI ATM Debit card pin then no need to visit Bank, you can change it online through net banking. At the branch, they will charge you for the physical pin. Enter User ID and login password and click login. 2: After login, you can see the e-Services tab, click on it. Next screen, click on ATM Card Services. 3: Now click and open ATM Pin Generation option. 4: Select OTP or Profile password option for validation on next screen. If you select OTP then enter OTP receive on your mobile number or enter profile password. 5: Now select your Account number on next screen. 6: Next page, select your ATM Debit card number and submit. 8: And finally, enter the four-digit pin. First two-digit you set in the previous step and last two-digits you received on your mobile number. Click on submit. That’s it Your ATM card pin changed successfully. 1# Visit any SBI ATM near you. Insert your card and remove. 2# On ATM screen, you can see PIN Generation option, select this option. 3# Now enter your Account number and select confirm. 4# Now enter your 10-digit registered mobile number and select confirm. You will receive an OTP (Green PIN) on your registered mobile number. This OTP is valid for 24 hours. This green pin used to login ATM for pin change so don’t confuse. 5# Now again insert your card and on main screen select Banking option. 6# Now enter PIN which received on your mobile number to enter. 7# Next screen select PIN Change option. 8# And finally enter 4-digit PIN of your choice and confirm. Done! you have successfully changed your SBI ATM card pin through ATM. 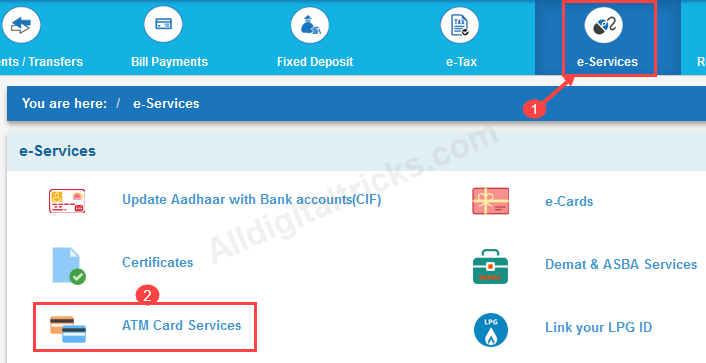 So this is how to Change SBI ATM Debit card pin online and through ATM.